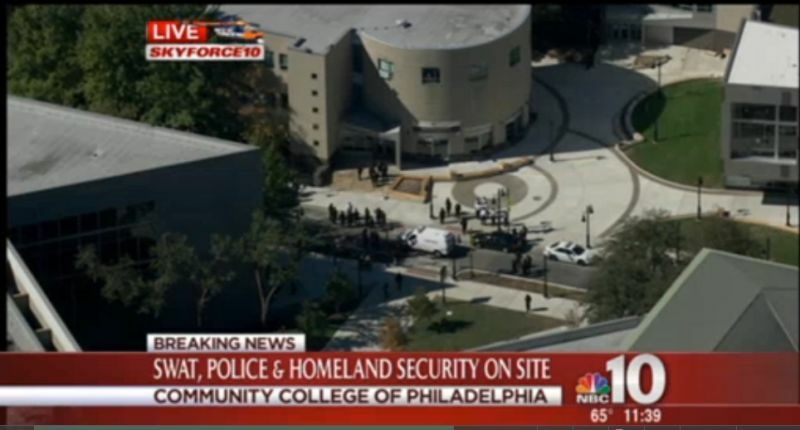 Community College of Philadelphia, Tuesday, October 6th at around 10:30. The incident occurred last Tuesday, October 6th while I was in my office preparing materials for my remedial composition class. I’d taken a risk: it would be a semester of James Baldwin. 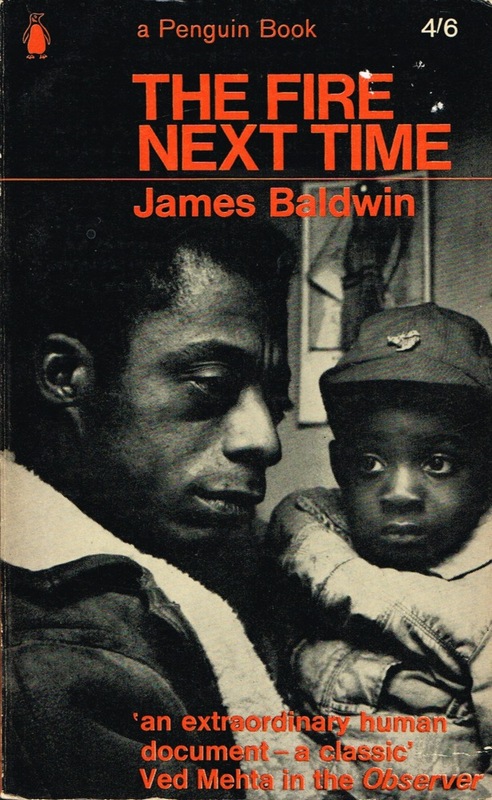 We’d already plowed through the dense and paradoxical “My Dungeon Shook”, Baldwin’s 1962 letter to his nephew that opens The Fire Next Time, and now were around seventy-five pages into his novel, If Beale Street Could Talk which, like everything Baldwin writes, is simultaneously profound and profane. Even if my students couldn’t write at the college level, they were reading material that was undeniably not kids’ stuff. So far, they seemed game. I was refining a grammar quiz on sentence structure, and creating a model outline for their second essay, and only vaguely noticed that I’d received several emails. The first was from 10:43 . The subject heading has a red flag: “Send Word Now Alert”. The text: “Due to police activity, the Winnett Building is on lockdown”. My class was scheduled for 11:20 that morning. I had no idea what any of this meant, frankly. What is a “lockdown?” Obviously, the front door of the building is locked, but I wasn’t sure how to reply to the students who’d received the alert and began to ask me whether class was cancelled. Given the recent shooting in Oregon at Umpqua Community College a week before, and an internet threat to a Philadelphia colleges that appeared over the weekend, our own campus had increased security, locked a few entrances, and made us all show college identification, a pain in the neck on a campus with close to thirty-thousand students who come and go throughout the day. While teaching the night before, I heard a boom; so did a couple of students. We looked at each other. Then, we kept talking about sentence structure. The circumstances couldn’t help but feel abstract, at least to me. Even after the Tuesday morning emails, I thought: the best response is to keep going. I wandered out of my office to find students lining the hallway windows, staring out at the college courtyard. They held up their phones and took photos. They’d heard rumors about a gun on campus. They were all youngish, African-American, and deliberately blasé. Outside, police stood around in the sunshine. One girl preened herself in a mirror app on her phone and observed, “My hair’s standing on end.” She looked pretty calm. We watched one young black man with long dreadlocks came out the door, probably a witness, flanked by police, and someone called, “He’s a snitch.” A woman followed, also with police on either side. “Snitch!” They all assumed the police are dangerous racists to the point where they wouldn’t understand why any African American with an ounce of sense would trust them. Community College of Philadelphia is proudly urban, an affordable, open-admissions option for anyone who graduates from high school or earns a GED. Philadelphia’s public schools are currently in free-fall, particularly in neighborhoods where gun-violence is routine. On a deeper level, the prison-like vocabulary of a lockdown is familiar to our students because so many of them know someone in prison, or have been in prison themselves. I don’t. I’m a fifty-two year old white lady with school-marm glasses around my neck, and I couldn’t help but hear the question as a kind of sarcastic dismissal. They wanted me to know that what was going on that day was pretty much what went on in their own neighborhoods. They knew the ropes and they knew the rules. I was obviously a teacher at this college, but now they could teach me a thing or two. As I walked downstairs to the copy center, a growing anger drove me on, but I couldn’t figure out where to direct that anger. I walked through a lobby of locked-in people checking news sources that gave contradictory information: Did a student pull out a gun in a Spanish classroom. Were shots fired? No one knew. The copy center had its grate down; the workers gave me a strange look, but gamely duplicated my handouts. They clearly thought I was insane. I walked up the three flights to my classroom, opened the door, and met a startled group of students and their teacher who wouldn’t budge. The teacher insisted that they’d been told to remain in place– some instructors even turned the lights out. When I said, “But my class is here,” they laughed at me,and I was informed, in no uncertain terms, that no students would show up at all. In fact, one student did appear, and we sat outside the classroom and went through some exercises on finding subjects and verbs in clauses. Our voices sounded eerie as hell in that hallway. Apparently, I wasn’t obeying orders; I wasn’t supposed to leave my office. Students had to remain in their classrooms, as a SWAT team searched for a young man who’d allegedly had an altercation with another man outside the Winnett building and pulled out a gun. Yet even when I knew I was out of line, even when another instructor told me– in a hushed tone– that there was an empty classroom with a door that closed and we ought to be in it, I kept sitting there, waiting out there to see if another student came along. The following may explain my behavior: this summer, I joined a Christian Peacemaker Team delegation to Hebron in the West Bank. As I wrote in a series of essays that were posted in Jewish Currents, one of the great horrors of Hebron and of the region as a whole was that conditions of occupation had become routine, and violence constant and ritualized. Every Palestinian knows someone in prison; time served is a rite of passage. In Hebron’s Old City in particular, Palestinian children throw stones to defy Israeli soldiers, but also to get out of school. In the context of these impossible circumstances, most of the groups we met with on the West Bank would define resistance this way: to open a kindergarten on time, to start a women’s craft cooperative, to forestall the demolition of a village for a month– or day. Just keep going. And slowly, I understood why I was angry . It struck me, hard, that disruption, guns, and lockdowns were all absolutely normal to our students. What wasn’t normal, what was, in fact, radically counter-cultural was a space where those things didn’t happen. I’ve been teaching at my college for over twenty years, and for most of my career, the college has been that space, open and trusting, with cursory I.D. checks only after five o’clock, open doorways that are closed only when noise carries through the hallways, and a consensus that we trust each other. Now, all of that would change. That Tuesday, after the lockdown was lifted, we got an email: “Out of an abundance of caution…” classes were cancelled for the rest of the day, and I could not contain my fury. 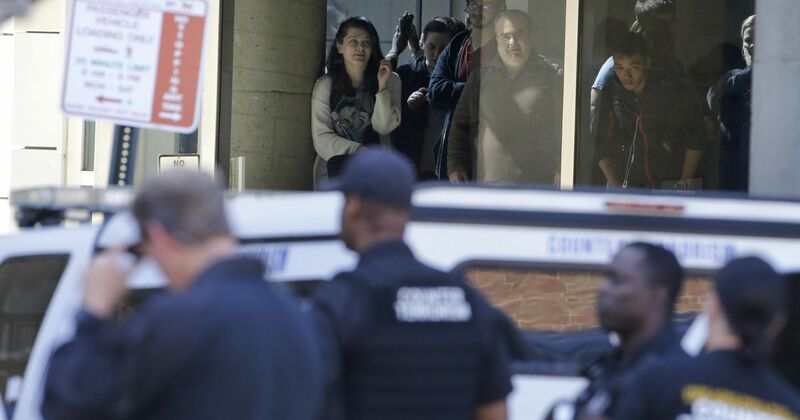 Somehow, I was not surprised to learn that within two days, two Philadelphia high schools went on lockdown when guns sightings were reported. Now, I fear, my college could begin to resemble a world our students know well, in other words, a prison. It’s clear that scanning IDs makes no difference when the young man who allegedly provoked the incident that caused the lockdown was a student. The next step would be metal detectors, which are common in Philadelphia high schools, but how will that help if the campus incident takes place outside? Will police presence increase? What about random pat-downs of students who fit a certain profile? We fall back on responses so familiar that they feels obvious; we slip into them as into a warm bath. I know some faculty want classroom doors that lock; I need to ask: what are we locking out, or locking in? I heard a rumor that during Tuesday’s lockdown, a terrified student shut himself in a storage closet. One might certainly argue that increased security is a logical response to a violent culture, and until that culture changes, we would be foolish to pretend it doesn’t exist. Plenty of people I respect point to how easy it is for our students to purchase guns, and to the power of the gun-lobby in this country. There may be a groundswell of support for new legislation, but honestly, how can this help us face immediate problems? What can we do right now? I’m sure that more than a handful of our students bring guns onto campus. Some might even be sitting my the classroom while we’re talking about James Baldwin; I can’t know what’s in their heavy backpacks where I make them store their cellphones. 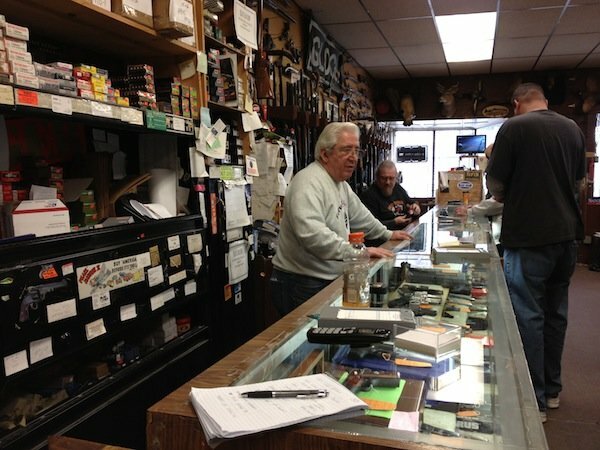 As we argue about a passage in “My Dungeon Shook”, or discuss tricky apostrophes in possessives, a gun might be one of countless elements that lie beneath the surface. Yet what I assert is this: I don’t care. Really. That feels like a risky thing to say, but given the alternative, I have to mean it. The work we do must take place– like the work of the people I met in Hebron– counter-culturally. It has to be based on trust, or it is impossible. We can’t know everything about our students, but must make several assumptions. We must assume that they are present by choice. We must assume that while their complicated lives might both disrupt and motivate their education, the classroom can’t resemble those lives. Does this mean that one of my students could take issue with an interpretation of a line of Baldwin, and pull out a gun? What then? I don’t know. It’s never happened to me, which doesn’t mean it won’t happen next week, or next year. Yet do I want that student to have an opportunity to be in my classroom? I’ll say it here: Absolutely. Thank you.. I passed it on to friends that are former teachers! I’m not sure all teachers will agree with me, but thanks, mom. Read your post on the lockdown with great interest & more than a few tears. While you were living through CCP’s lockdown. I was at a strategic planning retreat at Temple, which was interrupted for regular reports about what was happening (and not happening) at CCP; some of my colleagues had children in class there and the rest of us had lived through police warnings the day before. I think you are exactly right, though, that the lesson of Hebron is to continue about your day. Existence is resistance.